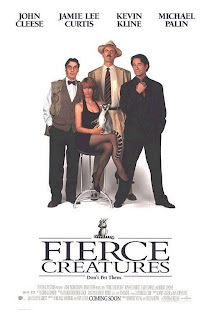 After watching A Fish Called Wanda, it was inevitable that I eventually watch Fierce Creatures. While the movie isn't an actual sequel, it does happen to feature almost the exact same cast in another quirky comedic setting created by a similar creative team. Obviously the producers figured that they might hit paydirt twice with generally the same elements in play. I can't say that was entirely true - the movie was indeed enjoyable but it didn't quite surpass the prior movie. I know they're not directly connected in a franchise, but the need to compare is inevitable. To be fair, the movie still had a lot of great moments. And that's probably something inevitable given the talent involved in this production - and I'm not just saying that because I'm a major Monty Python fan. But I suppose my main challenge was the overall story - it just wasn't as gripping as the last one. Of course comparing a crime caper story with this somewhat more generic comedy is probably an apples and oranges sort of case. Fiece Creatures is a bit of a follow-up to the prior movie, but like I keep saying it's not an actual sequel. This 1997 comedy was directed by Fred Schepsi and Robert Young with a screenplay by John Cleese. The story starts with the announcement that the Marwood Zoo in Britain has been acquired by a New Zealand multinational corporation known as Octopus, Inc. CEO Rod McCain (Kevin Kline) requires that all Octopus companies generate a 20% profit margin for all investments. Thus former British Hong Kong policeman Rollo (John Cleese) is hired to bring the zoo in line with that financial imperative. His unique plan to help the zoo generate more revenue is a strange one - to require that only "fierce creatures" be on display at the zoo and all friendlier animals be disposed of one way or another - a plan that is naturally unpopular among the zookeepers including the ever vocal Bugsy (Michael Palin). Meanwhile at Octopus, Inc., Willa Weston (Jamie Lee Curtis) is trying to maneuver her way up the corporate ladder. She eventually decides that her best ticket up is to take over the zoo herself and find a way for it to generate the necessary revenue. She eventually gets somewhat entangled with Vince McCain (Kevin Cline), Rod's son. While he is in fact the Vice President for Marketing, Vince's interests in this project are more along the lines of trying to get into Willa's pants, and maybe prove something to his father while he's at it. At first the narrative felt a bit disjoint. On the one hand you have the various antics between the zookeepers and Rollo as the main source of entertainment. On the other we have Kevin Kline playing two characters who antagonize one another. Well that and the need to constantly hit on Willa at all possible instances. It gets a bit tiring over time, but I suppose there's a point to all this. Things only really start to come together once Willa arrives at the zoo and the primary cast is finally reunited. They certainly play off one another very well and this is where the bulk of the comedy of this movie lies. The continued bits with Kevin Kline as both father and son does get tiring though - I felt this was a bad decision in terms of the writing and we really didn't need to deal with them being exact duplicates. The various attempts to generate additional zoo remedy do even up playing out like an odd extended Monty Python sketch. However it's not a particularly good one as it extended further and further. I think I was still on board for the efforts to make cute animals appear fierce. However the sponsorship side to things felt a bit old hat. The movie was largely okay - and just okay at that, which I suppose given the cast was a bit disappointing. It might have worked better for me had I not seen A Fish Called Wanda since that movie made it very clear what this one could have been. Seriously. Fierce Creatures remains a decent comedy, one that I can understand has probably fallen back into the less clear memories of the comedy genre. It still gets a good 3 cute and cuddly animal attacks on park keepers out of a possible 5.